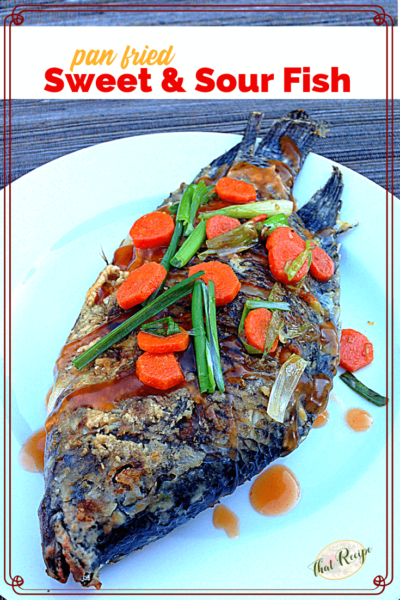 This Pan Fried Sweet and Sour Whole Fish is layered with flavors, and so easy to make. Serve it on Chinese New Year’s Eve or any time you have the hankering for some delectable fish. This dish is perfect for Chinese New Year. The sweet and sour flavor represents love and passion combined while the word for fish, “yu” in China has the same sound of the word “abundance and prosperity”. 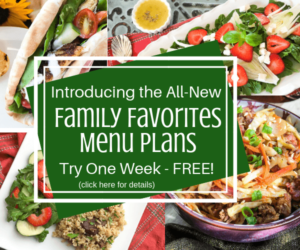 Plus, it is a great dish for Meatless Monday or Lenten Fridays or for anyone looking to add more fish into their diet. You can use any type of whole white fish you’d like for this recipe, we recommend tilapia, sea bass or cod. Unless, you want to scale the fish yourself, try to find one that is labeled as “dressed.” That means it has been scaled, the insides have been removed and it’s ready to cook. 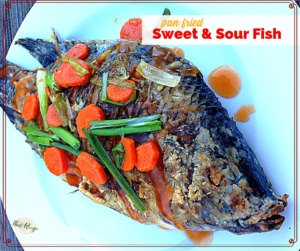 Pan Fried Sweet and Sour Whole Fish is a simple way to prepare white fish such as tilapia, sea bass or cod. 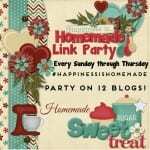 Perfect for Chinese New Year, Meatless Monday or Lenten Fridays. Make 3-4 cuts on each side of the fish, about an inch a part. Make sure to reach the bone. Rub the fish all over and into the cuts with rice vinegar and salt. Now, dip the fish into the beaten eggs and then rub with cornstarch to cover. Let stand for a few minutes. Heat a large frying pan with a few tablespoons of vegetable oil over medium-high heat. Make sure the pan is wide enough to fit your fish. Once it’s heated, cook fish for about 6 minutes per side, ensuring it’s cooked all the way through. While the fish is cooking, combine all of the sauce ingredients, except cornstarch mixture, in a small saucepan over medium heat. Once it comes to a boil, add the cornstarch mixture and stir until thickened. Remove from heat. Remove the fish and set on a serving plate once it’s done. Stir fry the ginger, carrots and onion for about a minute or so, until tender. Top the fish with sauce and vegetables and serve.